I had a customer just stop by with a nice new 2018 XMR 1000 that he swamped last weekend. He towed it home, checked his engine oil and found water in it, changed it out 4 times with new filters. Also changed and cleaned air filter box etc. Than he took it on a run and fount it was boggy at times when it got warm, mostly under heavy throttle but not always. Than the gear box blew a pile of oil out of his vent onto his front tire. He got it home and found water was in the gear box from when he swamped it, he flushed it out and took it for a drive and found it was still boggy. He than did a pressure test on each cylinder, front was 125 and rear was 150. This is when he brought it to me. I could not find any issue and told him to change the gas, he has not done that since he swamped it. My questions is shouldnt the cylinders be the same psi? Is this the fault when warm or does he just still have water in the system? No codes and buds does not pick anything up. No mods on bike other than slip on yoshi. Usually compression rises when it heats up. The metals expand and gaps close. 25 psi differential does seem a bit high of gap to me though. Maybe a bent rod on the low side giving it less stroke. It's it smoking? I have severe reservations that this ends well, heh. There's still water in the crankcase. ANY movement of internal parts with water in there, will ultimately lead to component failure. How many videos are on youtube that reflect the grit and muck remaining in the cases, despite numerous "flushes" by the owner? Anyway, I'll just refer back to my opening statement, heh. I agree guys. I told him to drain the gas, he said how would water get in the tank... I told him the same way it got into your motor and gear box. He agreed and went home to pump the fuel out and found a muddy mess in the bottom of the tank. Not sure what his plans are but I told him hes looking at long term engine problems and that it will still have dirt in.. well everything. 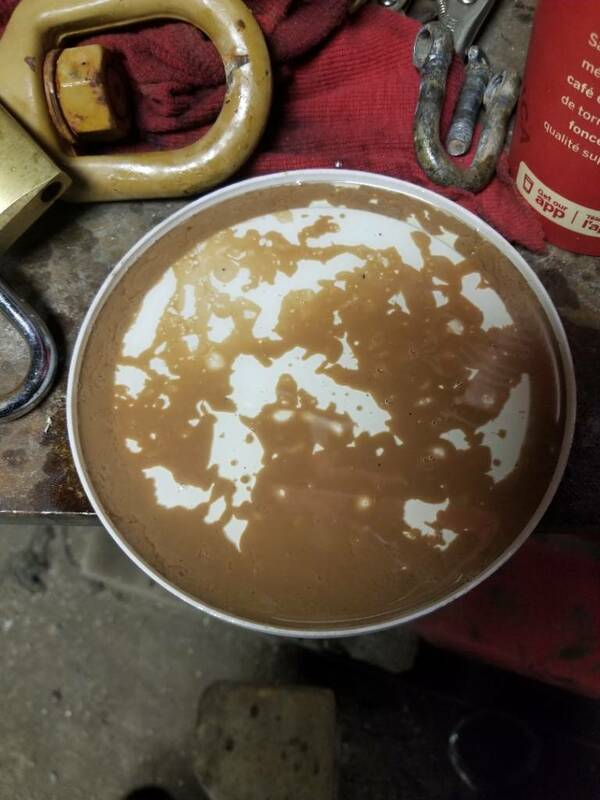 This is what was in the bottom of his gas tank. I just got off the phone with him, he seems like a pretty solid guy and is set on keeping his bike regardless what of needs to be done to fix it. Im sure he will be back with some more issues.